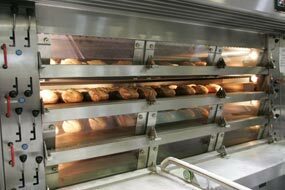 We produce all of our breads in Portland, at a facility built in 1997 that combines a little modern technology with old-fashioned baking methods. We still rely on small batches, short runs and a slow, hands-on process to produce artisan-quality breads. At the same time, we strive to upgrade our facility and equipment to ensure fast delivery of consistent products to our customers.